Made up of more than 7,000 islands, the Philippines is home to the world’s richest diversity of tropical marine life. The island chain supports more than 500 species of coral and 2,000 species of fish, making it a biodiversity hotspot and an important location for scientific research. 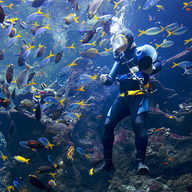 This exhibit replicates some of the diversity found in this vital marine resource. See how many species you can identify.